York gas furnaces that meet or exceed U.S. Environmental Protection Agency energy efficiency standards of 90% AFUE qualify as an ENERGY STAR product. That means when you compare them with standard models, you’ll find ENERGY STAR products provide a higher level of efficiency, cutting electricity consumption and cost.With several affordable designs to choose from, it’s easy to find the model that will keep your home warm and maintain indoor air quality, even on winter’s coldest days. And while you’re feeling comfortable indoors, you’ll also feel good knowing your system is using energy more efficiently to protect the environment outdoors.York products that bear the Good Housekeeping Seal give you the added assurance of product replacement or refund of the purchase price if the product proves to be defective within two years from the date sold by an authorized dealer,York is proud to offer the York Care Comfort Plan. It’s designed to maintain your system as well as your peace of mind. 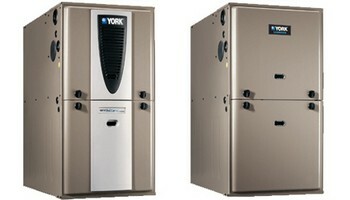 With York Care you get total protection that ensures your unit is effective and efficient for years to come. What’s more, your York Dealer offers maintenance agreements that provide upkeep while maximizing the warranty provisions. Ask about the York Care Comfort Plan. A little extra coverage is always a comforting idea,Select York systems installed after May 1, 2009, include a 10-year limited warranty on parts as standard coverage (when you register qualifying products online within 90 days of installation, otherwise the parts warranty reverts to a 5-year parts warranty). See your York Dealer for details. Complete your home comfort system by asking your York Dealer about ways to improve your indoor environment and protect your family’s health with our indoor air quality options. the parts warranty reverts to a 5-year warranty,Modulating burner design continuously adjusts heating level in small increments to match the degree of comfort you need.Variable-speed ECM fan motor provides quiet, efficient air circulation.Get a system tailored to your climate with integrated ClimaTrak™ Comfort System.Models available with up to 98% AFUE efficiency provide more heat for less money.Use the Affinity Wi-Fi Residential Communicating Control for greater control, more even temperatures and energy savings.Count on rugged steel heat exchangers backed by industry-leading limited warranty.Feel extra safe with 100% shut-off main gas valve.Complete Assurance Warranty Pledge: If the heatexchanger fails within 10 years of installation, we provide optional furnace replacement in lieu of heat exchanger equipment.Enjoy quiet, reliable fan-motor technology for comfortable air circulation.Fits comfortably in your home with compact 33-inch cabinet profile.Save with efficiencies as high as 96% AFUE for lower utility bills.Models available with high-efficiency condensing designs for through-the-wall venting or standard efficiency for natural venting with chimneys.Count on rugged steel heatexchangers backed by industry-leading limited warranty.Complete Assurance Warranty Pledge: If the heatexchanger fails within 5 years of installation, we provide optional furnace replacement in lieu of heatexchanger equipment.Get proven performance with single-stage burner operation.Fits comfortably in your home with compact 33-inch cabinet height.Cut fuel costs with efficiencies as high as 95.5% AFUE.Models available with high-efficiency condensing designs for through-the-wall venting or standard efficiency for natural venting with chimneys.Count on rugged steel heatexchangers backed by industry-leading limited warranty.Feel extra safe with 100% shut-off main gas valve.Get high capacity heating for larger spaces.Enjoy quieter operation with low-level combustion soundCut fuel costs nearly 20% compared to old models.Efficient design for a home with a chimney.Count on rugged tubular steel heatexchangers backed by industry-leading warranty.Feel extra safe with 100% shut off main gas valve.Get reliable silicon nitride hot surface heat ignition.